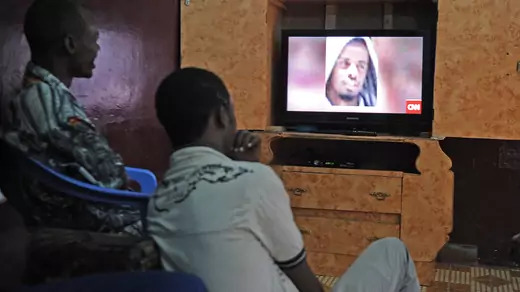 With brazen terrorist attacks at home and abroad, the Somalia-based Islamist insurgent group has proved resilient despite strategic setbacks in recent years. A coalition of eleven sharia courts form the Islamic Courts Union (ICU), naming Sharif Sheikh Ahmed its leader. 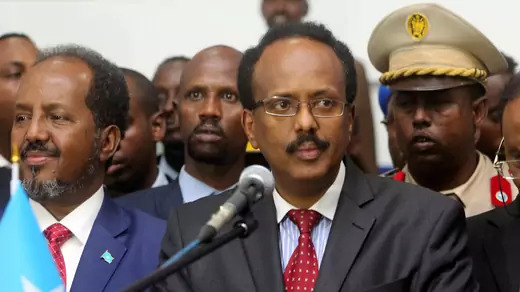 Somalia’s internationally backed Transitional Federal Government (TFG), comprising representatives of the country’s largest clans, is formed in exile in Nairobi. Abdullahi Yusuf is elected president of the interim body. Backed by al-Shabab militants, the ICU wrests control of Mogadishu after clashing with a coalition of warlords. Ethiopia, a majority-Christian nation, invades and takes Mogadishu with little ICU opposition. Galvanized by the invasion, al-Shabab transforms into the most powerful Somali guerrilla group, well funded and thousands strong. The TFG moves into the capital from its interim headquarters in the western city of Baidoa. 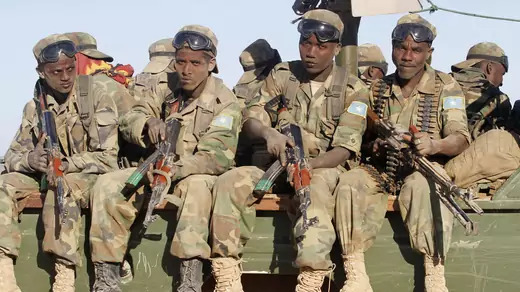 The United Nations approves a regional peacekeeping force known as the African Union Mission in Somalia (AMISOM) to support the TFG in its battle against al-Shabab. 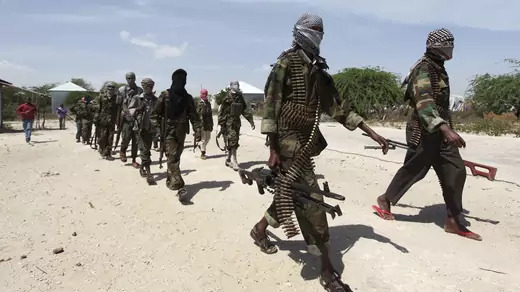 The U.S. State Department designates al-Shabab a foreign terrorist organization, blocking anyone in the United States from providing financial support to the group. Ethiopian troops withdraw from Somalia after a series of setbacks and are replaced by AMISOM forces. The country does not redeploy troops to Somalia until 2014, when it becomes a contributor to the regional force. Al-Shabab, in its first foreign terrorist attack, carries out multiple suicide bombings in Kampala, Uganda, killing seventy-four. AMISOM and TFG forces push al-Shabab out of Mogadishu and other major urban centers after a year-long offensive. Kenya invades southern Somalia in Operation Linda Nchi following kidnappings claimed by the militant group. The country’s forces are integrated into AMISOM in February 2012. Al-Qaeda chief Ayman al-Zawahiri announces al-Shabab’s affiliation with the jihadi network. Backed by local Somali forces, Kenyan troops sweep into Kismayo, ousting al-Shabab from its last major stronghold and cutting off a major source of the militant group’s funding. 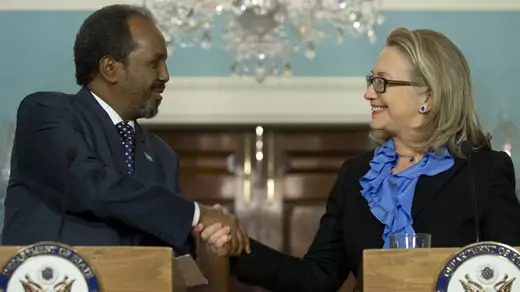 The United States recognizes the government of Somalia after a hiatus of more than twenty years. “There is still a long way to go and many challenges to confront, but we have seen a new foundation for that better future being laid,” says Secretary of State Hillary Clinton. In a multiday raid on a Nairobi mall, al-Shabab militants kill sixty-seven people. It is the deadliest terrorist attack in Kenya in fifteen years. The U.S. military sends a small team of advisors to Mogadishu to assist AMISOM forces. It is the first U.S. deployment since eighteen soldiers were killed in the 1993 Battle of Mogadishu. 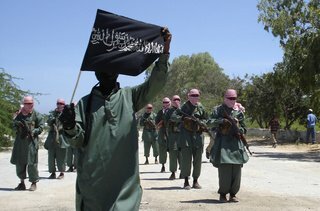 Ahmed Umar, also known as Abu Ubaidah, becomes al-Shabab’s leader after Ahmed Abdi Godane, one of the group’s founders, is killed in a U.S. air strike. Somali and AMISOM troops retake the southern coastal city of Barawe nearly six years after al-Shabab gained control of the area. 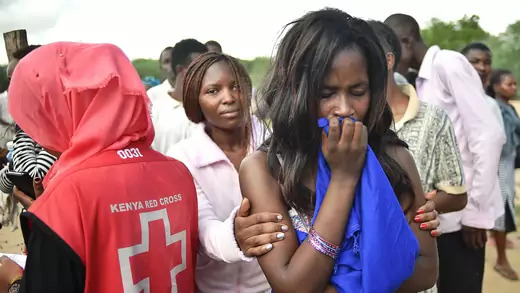 Al-Shabab militants in central Kenya kill 148 people at Garissa University College. The fifteen-hour siege, in which gunmen hold more than seven hundred students hostage, exceeds the 2013 mall raid as the group’s deadliest attack in the country. Former Prime Minister Mohamed Abdullahi Mohamed wins the presidency. The government hails the election as the final step in its decades-long path toward effective central governance, but international observers criticize the election as corrupt. 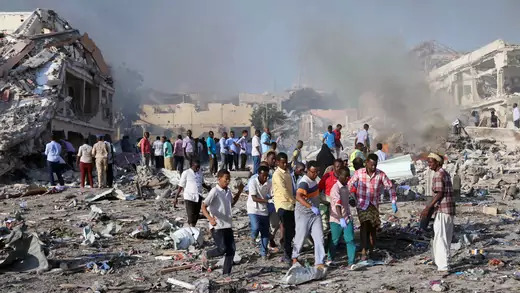 In Somalia’s deadliest terrorist attack, truck bombings in the capital city kill more than five hundred people and injure another three hundred. Al-Shabab is widely believed to be behind the attack, though it does not claim responsibility. Two weeks later, Shabab militants kill at least twenty-nine during a siege on a hotel in Mogadishu; the dead include senior government and police officials. More than one hundred militants affiliated with al-Shabab are killed in a single U.S. air strike northwest of Mogadishu, according to the Pentagon. The strike is one of more than two dozen in Somalia authorized by the Trump administration in its first year. The UN Security Council approves the withdrawal of a thousand AMISOM troops by the end of 2017, the first time it has cut peacekeeper numbers in Somalia, as part of a transition of security responsibilities to the Somali government. In July 2018, it votes to delay further reductions until 2019. Al-Shabab claims responsibility for a deadly siege at a Nairobi luxury hotel complex. At least fourteen people are killed and hundreds of civilians trapped amid an hours-long standoff between gunmen and security forces.